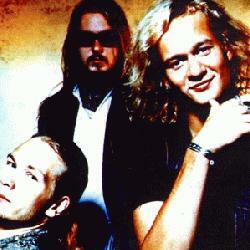 Kingston Wall was a psychedelic/progressive rock group from Helsinki, Finland, originally formed in 1987. Influenced by such artists as Jimi Hendrix, Led Zeppelin and Pink Floyd, the group combined eastern themes, mysticism and vivid psychedelia with acid-rock. The band consisted of Petri Walli (guitars, lead vocals), Jukka Jylli (bass, backing vocals) and Sami Sami Kuoppamäki (drums, percussion). Walli took the most active role in the band. He formed the group, composed most of the songs and wrote all the lyrics. He was also Kingston Wall’s producer and manager and ran the band’s own Trinity record label. Kingston Wall released their first album, Kingston Wall (later referenced and re-released as I) in 1992 under the Trinity label. Their debut album consisted mainly of psychedelic hard rock along with a cover of Jimi Hendrix’ song “Fire”, which gained the group some popularity among the Finnish radio stations. The album culminated in the heavily progressive, 21-minute track, “Mushrooms”. Their second album, II, was released in February 1993. This time the group brought in some more acoustic and folk elements to their songs, like acoustic guitars and violins in “Istwan” (violin played by Ufo Mustonen) and saxophones in “Shine On Me” (saxophone played by Sakari Kukko). They also included a cross-genre cover version of the Donna Summer disco classic “I Feel Love”. The third and last album from Kingston Wall, III – Tri-Logy, was released in autumn 1994. It was a very different album compared to the two previous ones as it included more hard rock sounds, at times combined with dub reggae, techno and synthesizers arranged by Kimmo Kajasto (from Koneveljet and Rinneradio). Most of the lyrics on Tri-Logy have almost religious philosophical/mythological tone in them, and they are partially based on the Bock Saga, an eccentric explanation about the origins of the alphabets, words and the whole human history. This story of Bock Saga was told by Ior Bock, a man Petri Walli knew well and most likely got to know him during his trips to Goa, India, where Bock used to stay at wintertime and tell his tales. When Tri-Logy was released, Petri Walli said in an interview that it was probably the most expensive self-financed album ever made in Finland. Tri-Logy was also considered by many as an almost megalomaniac rock-epic reminiscent of Pink Floyd’s The Wall album. The last song on the album, “The Real Thing”, runs for 18 minutes and again features Sakari Kukko on saxophone along with ambient synthesizer pads played by Kimmo Kajasto. Tri-Logy was to be the Kingston Wall’s last studio album. They played their last public show in Lepakko, Helsinki on December 1994 and their last show ever was some days later in S?rn?inen’ prison at Helsinki. After this, the band called it quits in a local cafeteria and each of the members went on their separate ways. Walli left for India and shortly after his return to Finland, on the 28th of June, 1995, jumped to his death from the tower of Töölö church in central Helsinki. This marked the end for Kingston Wall. Walli was later buried in the Hietaniemi Cemetery, about one kilometer away from his place of death. During their active time, Kingston Wall never achieved mainstream popularity. All their albums were printed in limited amounts and released on Walli’s own independent label, Trinity. It was only after the group had disbanded that their popularity slowly grew through word-of-mouth. Kingston Wall was known for their energetic live performances. The band held their own Freak-Out Club three times in Helsinki. They started playing live from small local pubs but as their popularity grew they could sell out the biggest clubs in Helsinki. All the original Kingston Wall albums and singles under the Trinity label have been since sold out and are regarded collector’s items. The trilogy was re-issued by a Finnish record label Zen Garden in 1998. A limited amount of 1000 copies included a bonus CD along with each of the three original remastered albums. The limited re-issues sold out quickly. The bonus CDs contained single B-sides and previously unreleased live recordings. In 2000, a remix album titled Freakout Remixes was released. This tribute album included techno and psychedelic trance remixes of the original Kingston Wall songs, made by such Finnish artists as Accu, Squaremeat and Texas Faggott. Kingston Wall has also influenced many Finnish rock groups and received cover tributes from artists such as The Rasmus (“Used to Feel Before” on Madness-single) and Amorphis (“And I Hear You Call” on My Kantele-EP). Although Kingston Wall never played outside Finland apart from one gig in Tallinn, Estonia during their early days, the group is considered even by many Finns as one of the country’s best hard rock groups. Their albums have appeared on the Finnish Top 40 album charts. The cult following status of Kingston Wall has also gained them a steadily growing fan base around the world, mostly thanks to the Internet. After a long period of silence, a live CD box set was released from Kingston Wall. The box set featured three CDs recorded from various gigs during the bands existence. The tracks were selected for this album by bass player Jukka Jylli. Jukka Jylli and Sami Kuoppamäki currently play in the Finnish rock outfit Zook.